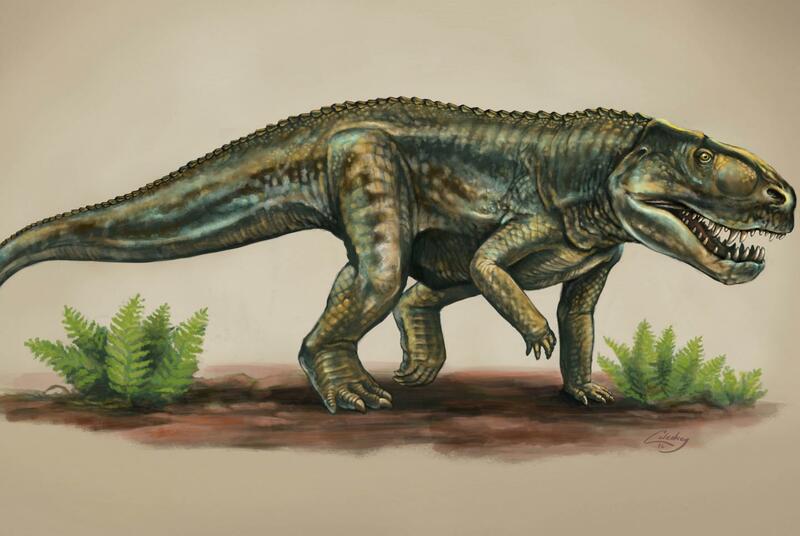 An extinct reptile related to crocodiles that lived 212 million years ago in present day New Mexico has been named as a new species, Vivaron haydeni, in a paper published this week by Virginia Tech's Department of Geosciences researchers. Leading the paper that names the previously unknown animal is undergraduate researcher Emily Lessner of Kennett Square, Pennsylvania, a double major in the departments of Geosciences and Biological Sciences, both in the Virginia Tech College of Science. Lessner's paper detailing the fossil of the animal - jawbones, other skull fragments, and hip-bones - appears in this week's open science journal, PeerJ. Vivaron haydeni was found in Ghost Ranch, New Mexico, in 2009 during an excavation co-led by Sterling Nesbitt, then a postdoctoral researcher at the University of Texas at Austin, and now an assistant professor of geosciences at Virginia Tech. Some of the fossils remained sealed in protective plaster jackets until 2014, when they were transported to Blacksburg for study. That's where Lessner enters. "Initially, I cleaned fossils in the lab and worked on a project reconstructing soft tissue structures using computed tomographic, or CT, scans on the computer," said Lessner, now a senior. "I began looking at Vivaron pretty soon after." The name of the new species came from Lessner. Vivaron haydeni is named for a famed, monstrous snake - 30 feet long - of Ghost Ranch lore, a story passed around campfires more than a century ago, and John Hayden, a hiker who in 2002 discovered the New Mexico quarry from which the fossils were collected. Vivaron was a carnivorous archosaur - a large set of animals that includes crocodilians and dinosaurs, as mammals includes humans and dogs. Vivaron itself measured 12 to 18 feet long, and walked on four legs. Thus far, three jaw bones, other skull fragments, and hip-bones from at least three individuals - two large, one smaller - have been found. "These were some of the biggest predators at the time, all dinosaurs were much smaller," added Nesbitt, speaking of the Triassic Period, more than 200 million years ago. "It is possible that other bones were not preserved, were previously collected, or are still in the ground," said Lessner, who added geosciences as a second major soon after beginning work on Vivaron. Bones of Vivaron that Lessner took apart, cleaned, and are on hand in the paleontology lab, some kept in protective sleeves and plaster jackets as they are thin and incredibly fragile. The detailed cleaning process was as much a learning process as any part of Lessner's work with the lab. "When you look at anything so long, so close, you realize extra details and patterns you would not otherwise notice," she added. Lessner said her undergraduate research experience has greatly enriched her college experience. "It has given me opportunities that simply attending class never has and has opened up doors for my future. I have been able to gain first-hand experience in the field," said Lessner. She has learned to write scientifically, met paleontologists from around the world, and participated in digs in Arizona, New Mexico, and Wyoming with both Stocker and Nesbitt. She has presented her findings to the Society of Vertebrate Paleontology; the Society for Integrative and Comparative Biology; the Southeastern Association of Vertebrate Paleontology; and will speak before the 2016 Society of Vertebrate Paleontology. All this in addition to being published in a journal by the age 22. She credits Nesbitt and Stocker for setting her undergraduate education on a new course. "They got here just as I was looking for them," Lessner said of her sophomore year looking for a new direction. Nesbitt said he is "paying it forward" when working with undergraduate students in the paleontology lab, as he himself began his career as a paleontologist via independent undergraduate research projects at University of California Berkeley. "These experiences are what really made me understand what it is like to think as a scientist and how to take on complex scientific problems one step at a time," he said. "Emily embodies a key characteristic all undergraduate researchers need, bravery,"said Nesbitt. "You constantly are in situations that you have never been in, from fieldwork in the middle of a desert to presenting research in front of 200 professionals." Added Stocker: "Emily has become an important member of our research group. She's taken on an increasing amount of responsibility since she first started with us, and she's now a leader among our students. She's ready to tackle the next steps of her career." Among her career plans, Lessner wants to enter a graduate program upon completion of her undergraduate degree and she wants to one day investigate the Triassic fossil quarries of her native southeastern Pennsylvania. "There is something for everyone, whether it be within your major or outside it, as mine was," she said of the variety of research projects and methods across Virginia Tech. "Contact and even work with multiple people, especially if you are unsure of your interests; do not be afraid to reach out to professors. Find something you really like and it will turn into something meaningful."